The history of the Clonmacnoise area has been well documented, and is always a fascinating read. This World Heritage Site Draft Management Plan is a good starting point. The ruins of the monastery of Clonmacnoise are located within 2 km of the site. 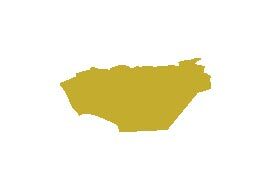 From the time of its founding in 548 AD until the thirteenth century there were major settlements in the area. 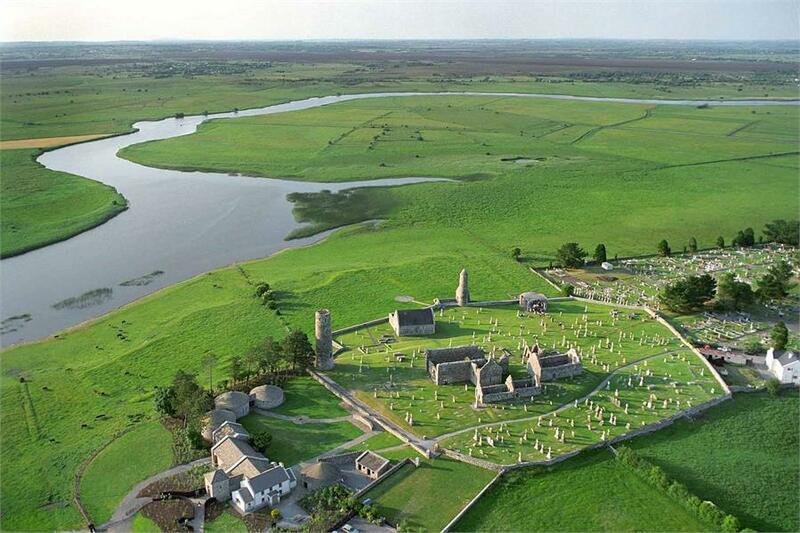 Clonmacnoise, with the River Shannon running close by. Did the monks cut turf? They probably did as turf was used in pre-Christian Ireland and was the only alternate fuel available alongside wood. It is believed that the edges of Mongan were cut on a small scale for centuries. In 1650 the Downs Survey mapped the area, showing that some of the margins of Mongan Bog had been cut for turf (Tubridy and Jeffrey, Eds. 1987). Bog Commissioners visited Mongan in the earlier part of the last century (Townsend, 1811), as part of a study to investigate the possibility of draining bogs in the area. The map they produced (reproduced in Tubridy, Ed., 1984) shows that the surrounding land had been cleared of forest and enclosed. Mongan Bog SAC from the air, with the Shannon and Pilgrim’s Esker to the side and Athlone is the far distance. There is a large cutover area to the foreground of the bog. 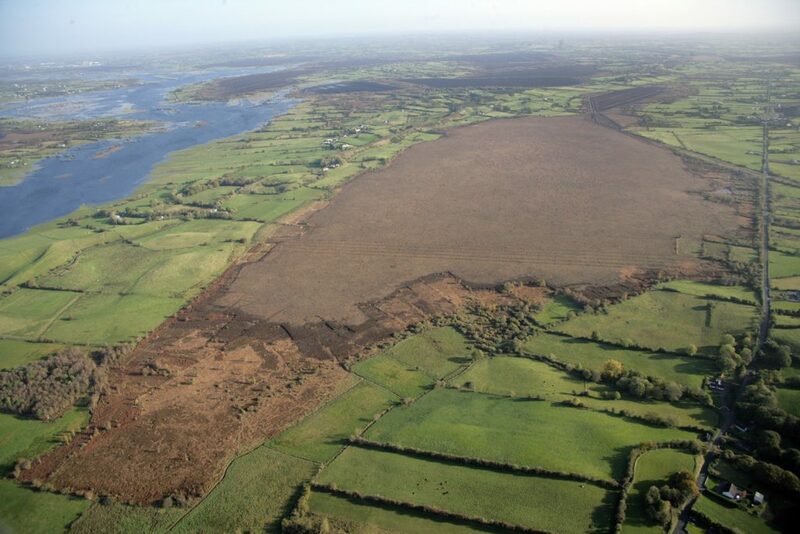 Peat cutting has been carried out around the entire perimeter of the bog, with an estimated 59.5% of the original dome cut over (Kelly et al., 1995). Turf cutting was widespread and posing a serious threat to the bog in 1983 (Tubridy, Ed. 1984) but this has abated over the years, due in part to negotiations by An Taisce, Bord na Mona and NPWS. 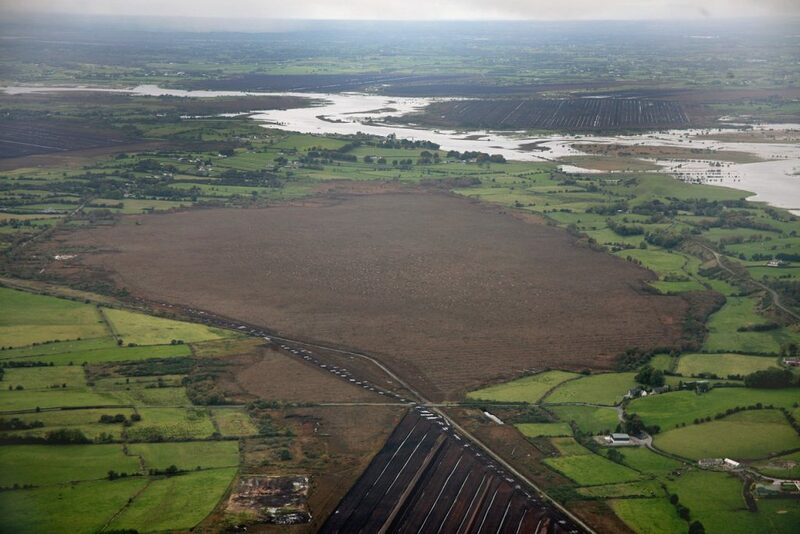 At the request of An Taisce in 1985, Bord na Mona contacted all claimants to turbary to negotiate the issue. Facebanks vary in height from less than 1 m along the north-eastern margin to over 2.5 m along the western margin. The northern edge has suffered the least from cutting. The current peat boundary corresponds closely to the original bog edge. On some of the older facebanks, the mark of the slean, the hand-cutting tool used to cut peat, is still visible. Peat cutting is no longer present at the site. This activity was only recorded at one plot to the east of the high bog in 2005 and was phased out in the reporting period 2004-11. Despite, the cessation of cutting at the site, old open face banks may still continue to drain the high bog. The site is mostly publicly owned, and An Taisce own an area of 119.00ha which is a designated Nature Reserve under section 16 of the Wildlife Act, 1976. The importance of Mongan Bog on a national and international level is reflected in its multiple designations. In 1987 Mongan was designated a National Nature Reserve and subsequently in 1988 it was designated a RAMSAR site and recognised as a Biogenetic Reserve as part of the Council of Europe network of reserves. 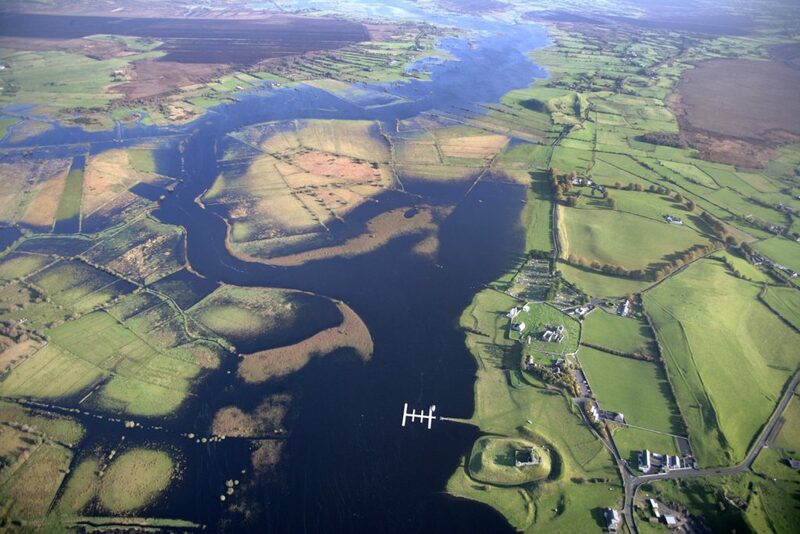 The area also makes up large proportion of Special Protected Area (SPA) for Birds, part of a proposed Clonmacnoise Heritage Zone, a Special Area of Conservation (SAC) and a Natural Heritage Area. In recent times, Mongan has become a part of Ireland’s Ancient East along with Clara Bog, and the area is a key attraction behind the VISIT OFFALY campaign. The Reserve was designated a Wetland of International Importance (Ramsar Convention, 1971) and a Biogenetic Reserve as part of the Council of Europe network of reserves in 1988. 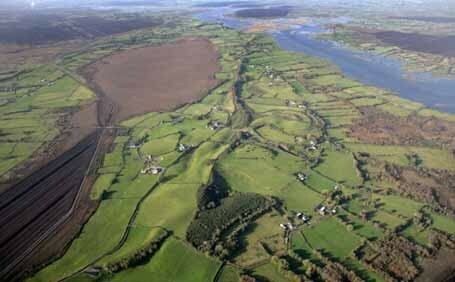 An area around Clonmacnoise (of which this bog is a part) has been declared a Heritage Zone. 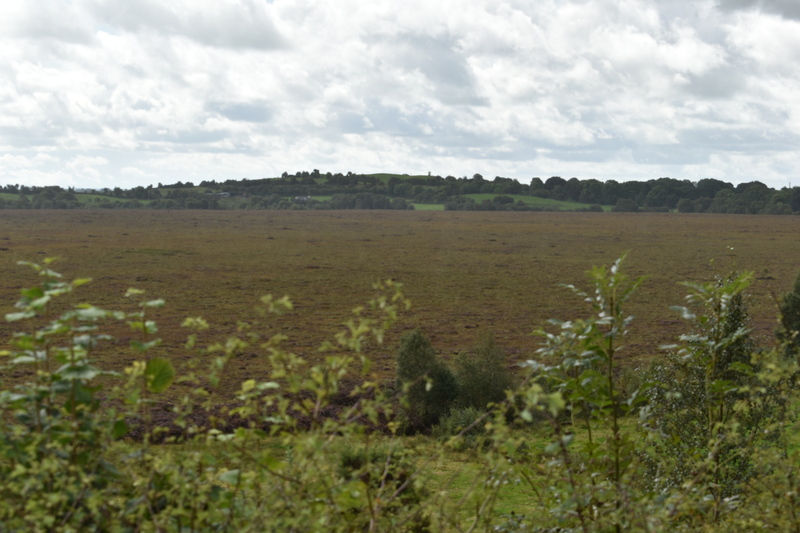 Mongan Bog is part of an Area of Special Control in the Offaly County Council Draft Development Plan.